This year I went to my first Blog Paws conference. What is it? It's a pet blogger's conference! It doesn't matter if your pet is a dog, cat, ferret, horse, or chimpanzee or if you work for a vet or rescue shelter. All pet owners, educators and caretakers were welcome and their pets! 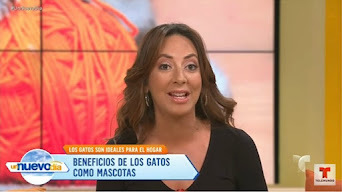 Fortunately, I've had the opportunity to appear on local TV and magazines for Riverfront Cats to raise awareness and educate the public about the plight of homeless cat, but blogging is a powerful way to regularly engage readers and motivate them to take action--pass on information about homeless cats or make a donation or both. There's so much to blogging than just writing. It's a bit of an art and science involving marketing, branding, social media, networking and more. This conference updated me on proven practices and techniques. One of the highlights was meeting famous bloggers that I had communicated with for months over email and Facebook but never met. So as I was staring at the name on the badge, the light bulb went off, and a verbal explosion and refrain ensued, "Oh my cat! You're Janea from Paws and Effect!". These are bloggers who excel at the trade and focus on the cute, the funny, their personal cats, cat behavior, or cat toys and furniture, etc. and have a loyal following. Each of these people have inspired me one way or another. ﻿ ﻿﻿ When I sounded the alarm on the Loews Hotel cat situation, I was amazed as to how quickly and readily these strangers were ready to help. Peter Wolf from Vox Felina in Arizona, Tamar Arslanian from I Have Cat in New York, Caren Gittleman from Cody Cat Chat in Michigan, Steve Dale--renowned pet behaviorist, pet columnist, pet radio host..and so many others. Two people who went above and beyond blogging about the Loews Hotel cats are Deb Barnes author of The Chronicles of Zee & Zoey, and blogger, and Dorian Wagner of My Daily Cute blog. Their efforts demonstrate that concerted tactics, incorporated into a blog, is powerful! ﻿ The conference also had various seminars focusing on tips and techniques to help improve our blogs. I'm already revisiting my notes and putting them into practice. Oh my! I have a lot of work to do. No time for cat naps. Like any conference, vendors were available to showcase new products and explain their benefits. I was amazed at the advancement and creativity of pet products from food, nutrition, grooming, training, odor control, pet decor and furniture, and the importance of a "Pet Trust" instead of a will to ensure your pets are protected like children and not used furniture that can easily be discarded at a shelter. Very informative and useful information for all pet owners. Off the top of my head was Rachel Ray's Nutrish (pet food), the FURminator (a grooming tool), and Pet360 (education on pet parenting). Blog Paws thought of everything. 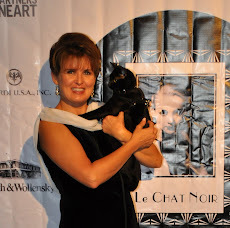 With increasing popularity of cats, this conference featured a "Catification Lounge" and a treasure room of modern cat furniture from Moderncat.net hosted by Kate Benjamin and Jackson Galaxy. 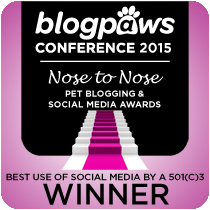 Thank you Blog Paws and fellow bloggers! You have inspired me more than you know. Together we can make a difference and help many homeless pets!!! 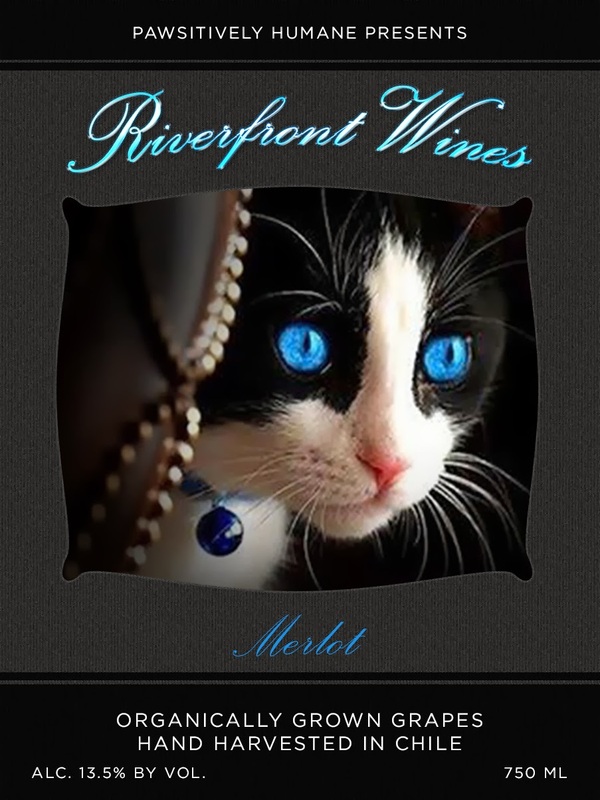 This is part two about a Riverfront cat named Charlie. In our first story, we introduced you to Charlie, a cat that was [illegally] dumped in our neighborhood. He survived which makes him one of the lucky few. This post covers his special flight arrangements to his new home country, the costs involved, and his temporary home. 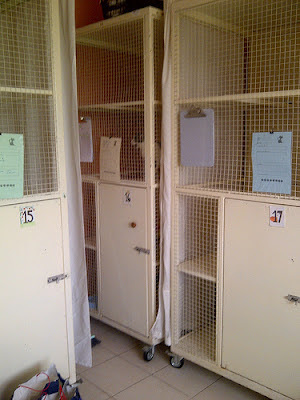 I learned so much about transporting pets and about one middle eastern cattery. ﻿﻿﻿﻿ When Charlie's foster parents fell in love with him, Nina (his new mother) shared that they were moving to Abu Dhabi of the United Arab Emirates (UAE). "The Middle East?!" I exclaimed. At first I was excited envisioning their exotic adventure living abroad, but then my brain rewinded. "But what about transporting pets and quarantine periods?..." I nervously pelted her with questions. Nina explained that the UAE does not require a quarantine period for pets originating from the United States. Whew! But the airline they had already booked required that pets fly in cargo. Let's see there's the flight from Miami to New York, the layover and then the long flight from New York to Abu Dhabi... "Where's that unpolished Aladdin's lamp when you really need it? Genie hello? We need a magic carpet!" I thought to myself. I shared my concerns with Nina. 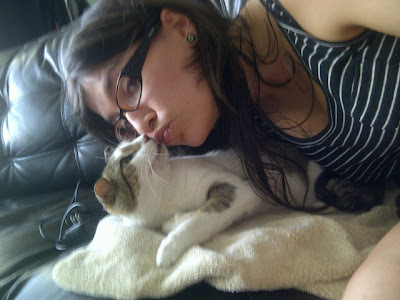 As a devouted mother who wanted to ensure the safety and well-being of her pet, Nina did some homework. The next time we spoke Nina had exhaustively researched all options. With the help of a local contact in Abu Dhabi, Nina learned about Air Animal, an airline that specializes in the transport of pets and any animal to various countries. In the above video, I'm visiting Charlie after learning he's moving to Abu Dhabi. Naturally there was an obstacle course of paperwork to complete including certain veterinarian medical tests, vaccinations, and certifications mostly requirements of UAE customs. Then Nina hired a private driver to pick up Charlie from the Abu Dhabi airport (he would arrive a day before Nina) and transport him to a temporary home, a cattery. The total costs to transport Charlie including the UAE's customs' fees for bringing a pet, the Animal Air fare, and the driver totaled $2,500. Notary was not required. I was so impressed. 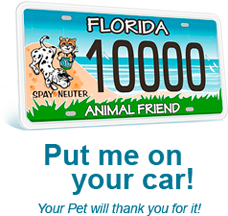 This is a model example of a responsible pet owner. So Charlie was set to travel on a Wednesday and Nina delivered him to the airline near the Miami airport. She also packed his regular food, both moist and dry and included her shirt as his blanket inside the carrier, a familiar scent to ease any anxieties. Upon arriving at Animal Air, Nina notified me that his flying neighbors were ducks! (They should have named the airline "Noah's Ark"!). Apparently the carriers are placed inside oversized cages that are secured inside the cabin. The airline made a stop in Dusseldorf where Charlie was given additional food and water and the airline contacted Nina with the update--wow talk about personal service every step of the way! 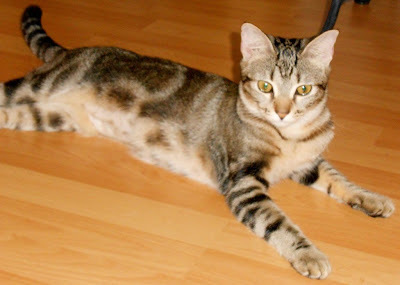 Upon arriving in Abu Dhabi, a driver picked up Charlie to chauffer him to the cattery while Nina and Felipe would reside in a nearby hotel until they found a permanent home. (Hmm, he's starting to look and sound more like his nickname "Richie Rich"). Nina arrived on Friday and immediately went to visit her baby. She would visit Charlie every day except Saturday is which like Sunday in the US. (In UAE their weekend is Friday and Saturday). 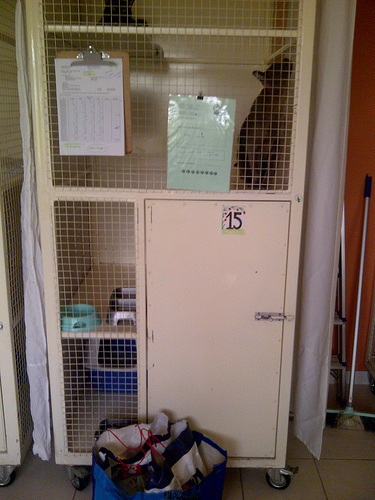 The cattery is housed in a typical Middle Eastern style two-story villa. Each cage is taller than a human with four "shelves" on one side so Charlie has plenty of room to climb. Even Nina could fit into the cage facing the shelves. Curtains separate cages so cats have "privacy"
So how is Charlie adapting? According to Nina, one day he just wants affection and constant petting, the next day he's playful, and the next day he wants to explore other parts of the cattery. Yup, he's adjusting like most curious cats. 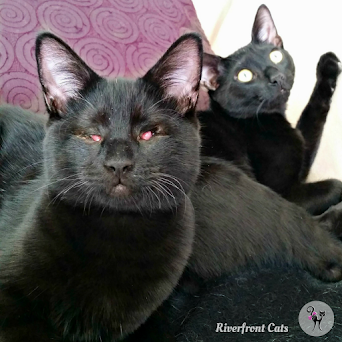 It won't be long, perhaps another week, before Nina, Felipe and Richie Rich move to their new home. We'll keep you posted! Charlie welcomes your comments and cat wishes. Click "comment" below. Click here for Part III "Charlie's New Home in Abu Dhabi"
This is a story about a cat named Charlie that was dumped in the neighborhood (please know this is illegal and hidden cameras are now installed). But this posting is just the beginning and will warm the cockles of your heart. 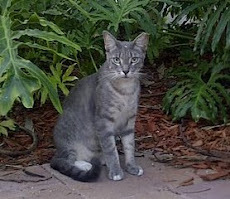 When taking care of outdoor community cats, new cats appear. Where do they come from? Some newcomers are from the area and dead end at our community which stops at the river (I've never seen a cat cross the bridge) while others are sadly dumped. Sometimes the cats move on, some persevere perhaps due to hunger, and withstand cat fights from the territorial Riverfront cats and linger for food and eventually a safe resting place. 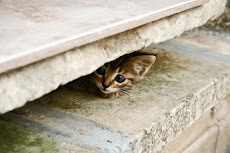 Last November, while feeding the Riverfront cats, the outdoor security guard mentioned he saw a new cat. "Oh no," I thought. It's been awhile since we've encountered new cats. Was he or she passing by or was this cat dumped here? We learned the answer to that question later. More importantly, was it spayed/neutered? When I spotted the new kitty, I gingerly placed a bowl of moist canned food along with a bowl of room temperature cat milk (my secret weapon to earn a cat's trust). It worked! Soon enough he jumped on the ledge at station 3 (we have 4 stations) that I could identify hanging testicles--yup he's a boy! And unneutered. In the meantime, from his round child-like inquisitive face, we anointed him the name Charlie Brown. But we call him Charlie for short. After a few more feedings at station 3 Charlie ran up to me uninhibited to pet him! That feeling of earning the trust of a once-scared animal is so profound. It's a combination of joy and falling in love. I couldn't stop smiling and talking and...dare I admit it? Baby talk! He was a new bundle of joy ready to accept me as his caretaker. Now this happened in January of this year. Charlie was a lovebug with all the volunteers. He absolutely loved to be petted. It was a merry-go-round of rubbing against my legs while I scratched his head and down his back and he circled around me to repeat the process. Clearly he was around people before and was most likely someone's pet. How can people be so cruel? Did they know dumping a pet or stray animal is illegal in most states? Yes even for ferals and strays. New surroundings are terrifying for a cat that they instinctively run away in search of "home" and encounter dangers and injuries. Thankfully Charlie stayed in the area. Then around March we finally had him neutered. Since he wasn't feral it was easy to scoop him up and place him in a pet carrier. But my heart and mind weighed heavily about releasing him back outside. Would he adapt to the indoors? Not all affectionate outdoor cats do. Finding him a home would also take incredible investment of time. I prayed for guidance and a miracle. 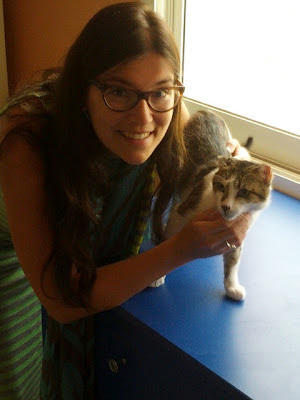 ﻿Nina was our newest cat-feeding volunteer and absolutely loved cats. But her husband Felipe made it very clear they were not ready for the responsibility of a pet. He's absolutely right. 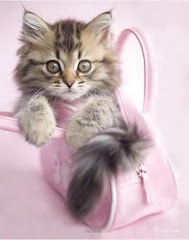 Pets need regular care, and attention to exercise and social development and well being, even cats. Nina and Felipe were college sweethearts and a newlywed couple. I admired their maturity and levelheadedness for their age. They also enjoyed traveling on weekends especially since Felipe worked for an airline. I asked Nina if she would be interested in fostering Charlie until I found him a home. After discussing the matter with Felipe, they agreed. Whew! Then the sweet turned to sour. Nina and Felipe were moving. Not just anywhere but out of the country in less than two months. No time to stress out. Automatically, I shifted into high gear with the goal to find him a permanent home before they moved. I asked Nina to take photos of Charlie in a home environment. Finding homes for adult cats is extremely difficult. Photos and a well-written story are critical. But Charlie had two advantages. For an adult cat he was small. At least he was a year old (I noticed cats still grow and peak at two years of age). Secondly he had the cutest, shortest ears that moved like insect antennas. At first Facebook cat owners commented that he might be a British curl. But alas...it turns out he had an ear infection that his ears never fully developed. It simply added to his charm. Just as I sat down at my desk with the determined task to draft Charlie's compelling story to place ads in Craiglist and Facebook, I checked emails and there it was. A miracle. Nina had shared that she and Felipe fell madly inlove with Charlie and wanted to keep him. After coming out of his shy shell, in two days he was nestled in between them on the sofa. Charlie loves cozy beds and to cuddle and belly rubs. Nina asked if I found him a home. (Oh gosh no). They wanted to keep him and start making plans to transport him abroad. While Nina is from France and Felipe from Colombia, I assumed they were moving to South America or Europe. Wrong! 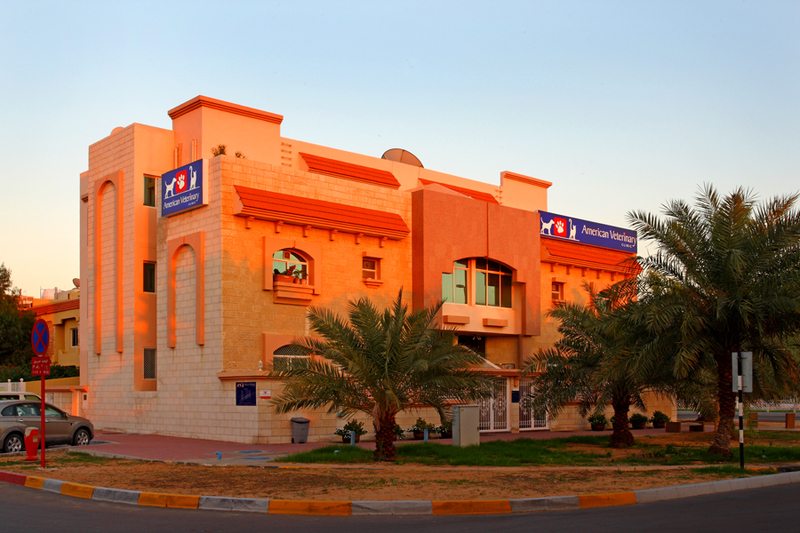 The family of three were not just moving out of the country but about to embark on an adventure of a lifetime--they were moving to Abu Dhabi of the United Arab Emirates! Oh my Bast!!! 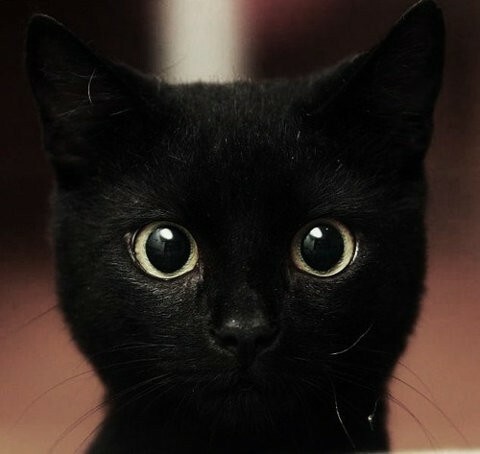 (goddess of ancient Egypt--she was a black cat the people worshipped). Felipe is a financial analyst and was recruited to work for their airline. Oh to be that age and move easily and explore the world. Nina leans over to kiss Charlie. mommy for belly rubs and nose kisses. ﻿﻿ Mixed emotions --joy and sadness--overcame me. Then a flood of questions: will he have to fly cargo? That's dangerous for pets for such a long journey. Is there a quarantine period? What is life like for pet owners in UAE? Is there an epidemic of homeless pets there too? And the cost to transport? Money didn't matter. To Nina and Felipe, Charlie wasn't just a pet, he was their baby. "You do whatever you have to ensure their well being," shares Nina. If only I could replay this scene to people dropping off their pets at the high kill animal shelter. This was a miracle. Even Felipe said "The person who dumped him missed out on something very special." To hear Felipe talk to Charlie in baby talk my with diminutive "ito" suffixes for every other word, my heart did back flips. Charlie's story is one to revel in for these victories are minimal compared to the hardships and let downs of the rescue world. Charlie is the luckiest cat in the world to be adopted by Nina and Felipe. They are truly a family. We have learned so much about transporting pets to the Middle East and future postings will chronicle Charlie's journey from the travel preparations, to the flight, his arrival and future home. Are you ready for a magic carpet ride? Leave a comment below! At this time we have two older kittens, 5 months. 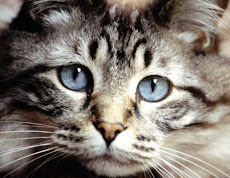 There is a distinct advantage in adopting older kittens and adult cats. First you know the history of their health. Second, it gives you the advantage of knowing the disposition of a cat. Maybe you want an entertainer with endless antics. Or a cat who loves belly rubs and to cuddle. Or perhaps a dainty, Miss Manners kitty who never jumps on counters or scratches your furniture. And remember, cats come in all shapes, colors, sizes and attitudes--just like dogs! 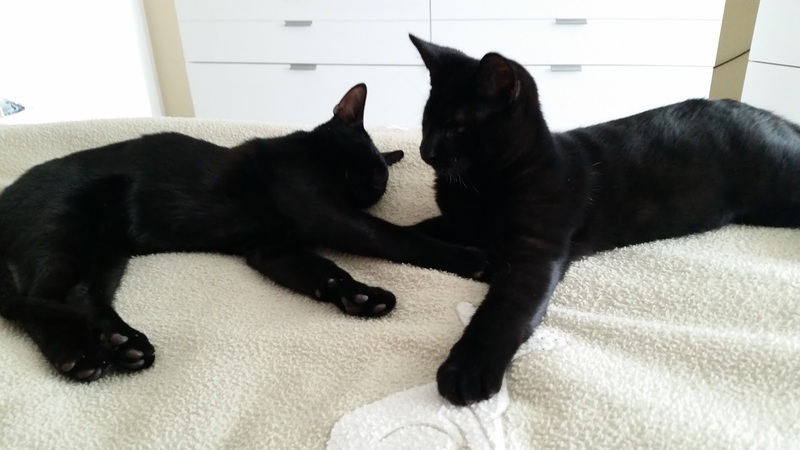 Rocky has bonded with his foster brother Ray Ray, another black kitten the same age. Except Ray was born with no eyes. But he can still walk, climb, and play like any kitten. 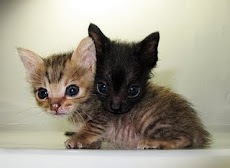 We require these kittens to be adopted together unless if you have another kitten the same age. 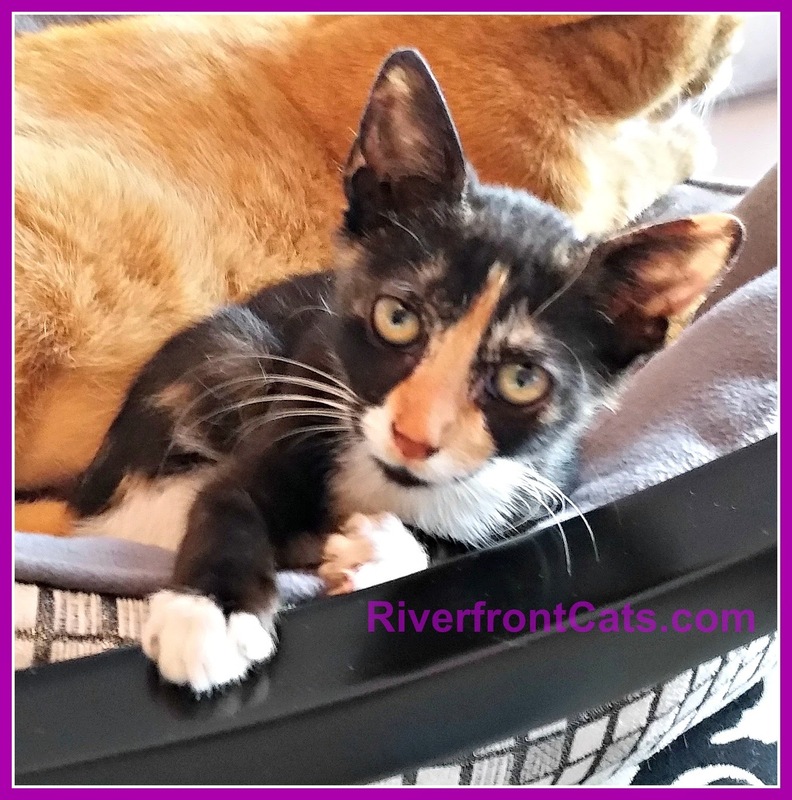 To meet R&R please contact us at riverfrontcats@yahoo.com. Located in South Florida (Miami, Ft. Lauderdale, Palm Beach) . This rescue male kitten is 10 weeks old. We just had our naming contest for him. Here were the choices. 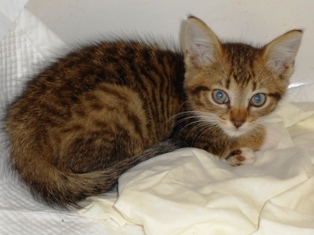 Snickers is one the Candy Kittens left for adoption. 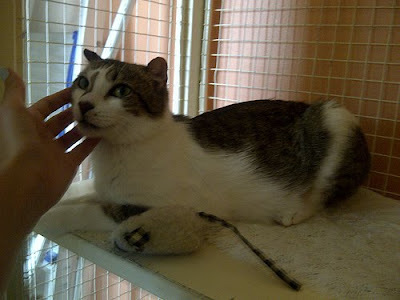 He is a darling's mama's boy who loves to play and get special pats. 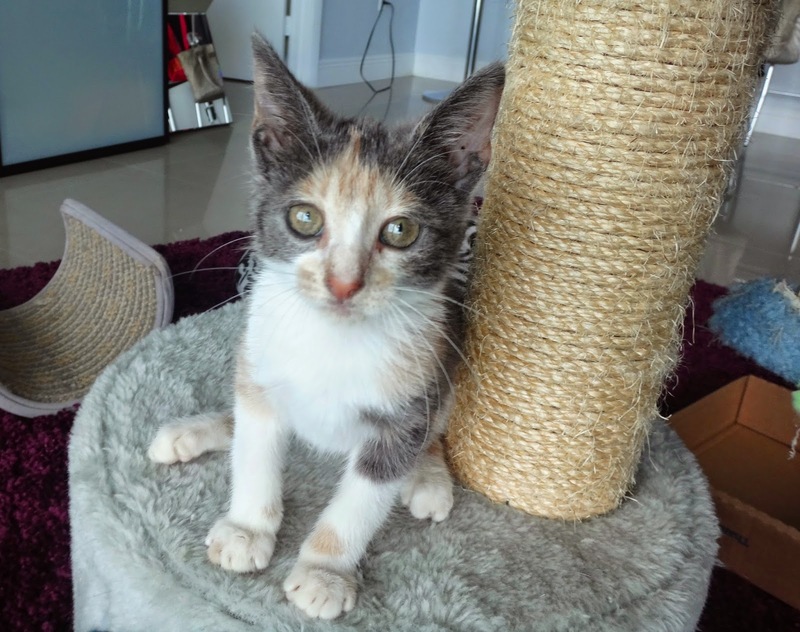 If you are interested in Snickers, please contact foster moms Karen/Joan/Alyssa at 305-205-4646, 786-301-0795 and karen90new@gmail.com. 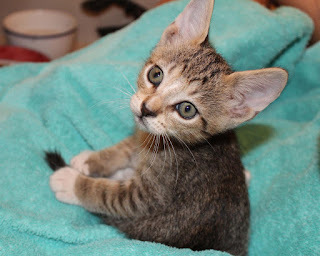 Twix is one the Candy Kittens left for adoption. She is is a doll who loves to chase feathers until nap-in-your-lap time.. If you are interested in Twix, please contact foster moms Karen/Joan/Alyssa at 305-205-4646, 786-301-0795 and karen90new@gmail.com. 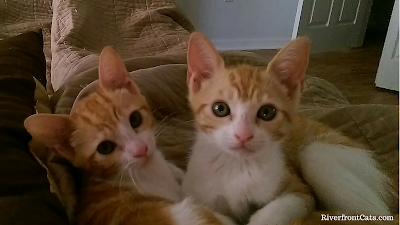 These sweet siblings are Jinx and Juju. She and her brother were separated from their mother at an incredible young age, which made Jinx develop a fear of abandonment. She is very kind, gentle and loving and loves to cuddle and getting pet. Juju on the other hand, craves adventure. He’s a rambunctious, boastful, playful, little daredevil. In the presence of his sister he appears to be fearless, but it’s just a facade. 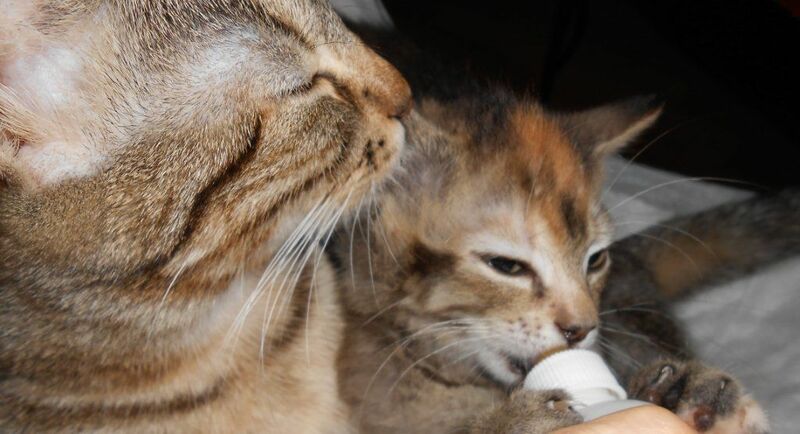 At heart, being separated from his mother has made this kitten a softie, hopelessly dependent on his sister. He’ll often lose track of her playing with his toy mice, then frantically look for her. He won’t sleep unless he nestled up against his sister with a paw around her. Given their situation, there is no place these kitties would rather be than in the embrace of someone that loves and cares for them. If you're interested in adopting Jinx and Juju, please contact Marlin Fisher at marlin.k.fisher@gmail.com. Meet Rogér, our own "Le Chat Noir". Rogér has gone through a lot (dislocated jaw and slashed throat) but he has made a nine-lives come back. Rogér's weight is now up to a healthy 12 pounds! He is gaining confidence and now expects individual attention and TLC. He would make a great companion for someone who enjoys comforts of home and quality time with pets. While he does well with other cats, Rogér will need to continue his special diet. He should do well in a friendly dog household too. If you are in the SOUTH FLORIDA area and interested in meeting Roger, please contact Karen Payne at 305-205-4646 or via email at Karen Payne karen90new@gmail.com. He’s a handsome little gentleman looking for his forever home! 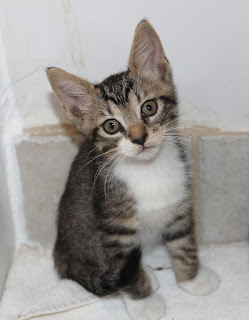 Mozart is a spirited young kitten that is excited to play, snuggle and spend time with you! He is up to date with all his vaccines, FIV negative and in perfect health. Mozart will be neutered and micro chipped. He needs an amazing forever home that will fall in love with him. Please contact Ruthie Mendez at ruthiemenendez@yahoo.com if you would like to meet him! Adoption application, home check and small fee required. 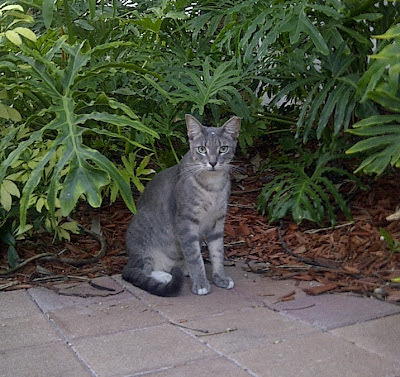 Sobe is named after her namesake birthplace--South Beach. She was plucked from a street curb at fragile 6 weeks of age. But like any South Beach celeb, she's not shy. Sobe is healthy and loves to play. She is supermodel and poses for photos but loves to steal sponges! To learn more click here. ADOPTED. 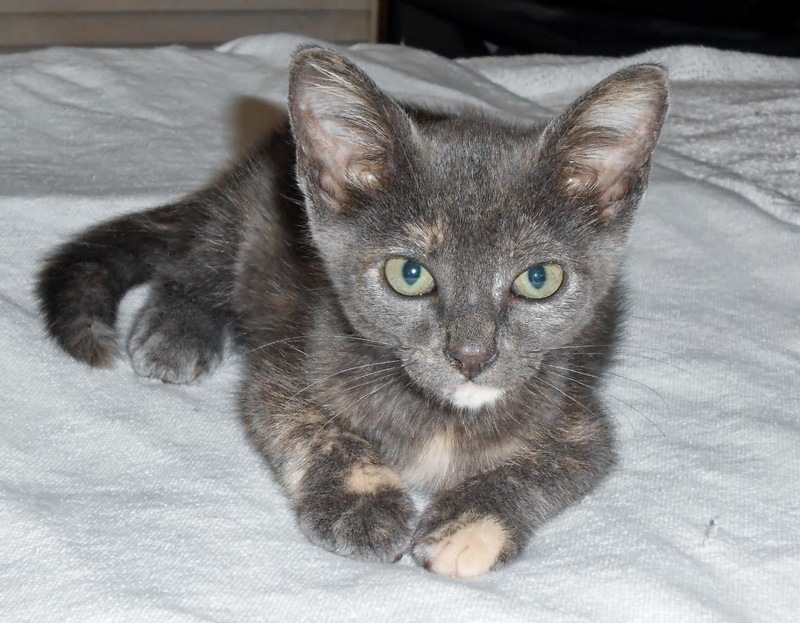 Hello, I am LUNA – I wear the colors of the moon, and how could you not love my little cream-colored chin? The vet’s office said I’m a “blue-cream dilute tortoiseshell” – sounds amazing, right? I think so! Not only that, but I’m a ball of energy, friendliness, playfulness, purring-ness, and LOVE! I am only eight weeks old and I'm ready for my forever home! 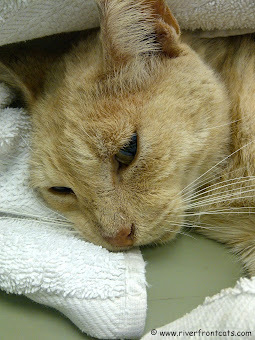 I am up-to-date on my shots, micro-chipped, and was de-fleaed and de-wormed and tested (negative) for FIV/FeLk. My foster mom will take care of my spaying, too, as soon as I'm big enough. All you have to do is provide me with a loving, safe, forever home! If you would like to meet me, please contact my foster mom Christina at cdm1580@bellsouth.net or call 786-573-1580 or call/text 305-338-4534. Thank you and I can't wait to meet you! ADOPTED. 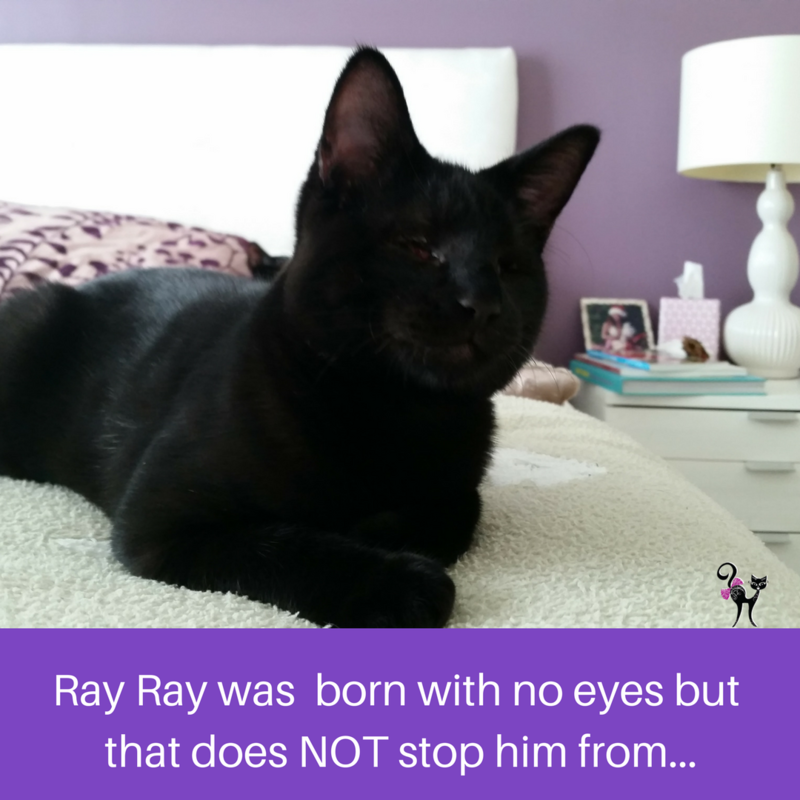 Ninji is a 9 month old black kitten with satin sheen. He does acrobatics, snuggles, is not shy of visitors & TALKS- no kidding! He has all his shots, neutered, and he’s waiting for you! Receive an adoption gift basket including a pet carrier, a guide book, toys, food bowls, story book and a bottle of wine! ADOPTED. 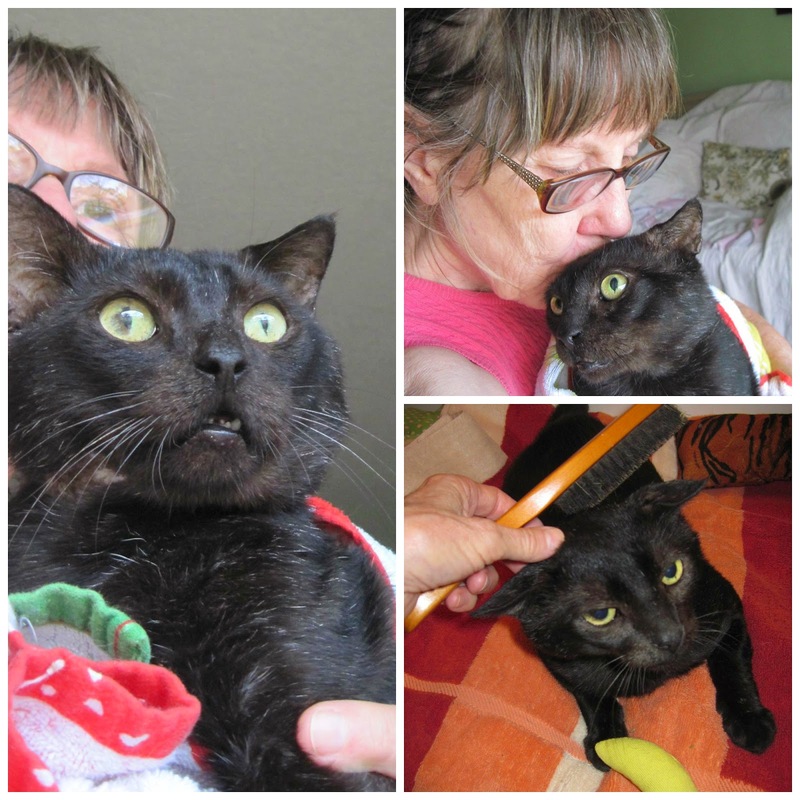 Fritz is a brave angel who survived poisoning by anti-freeze. Thankfully he's healthy with minor loss of vision. He acts like nothing happened. Click here to learn more! ADOPTED August 2014. 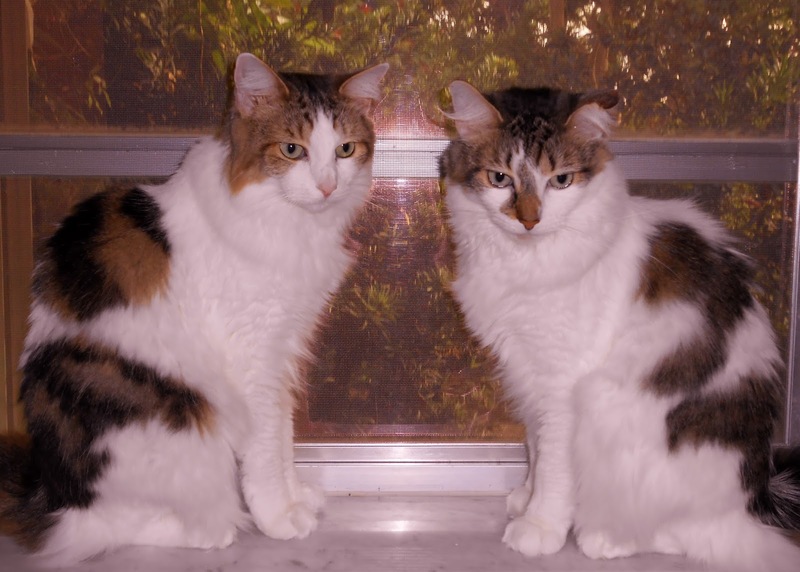 Millie & Tillie, 2 year old bonded sisters. To learn more click here. 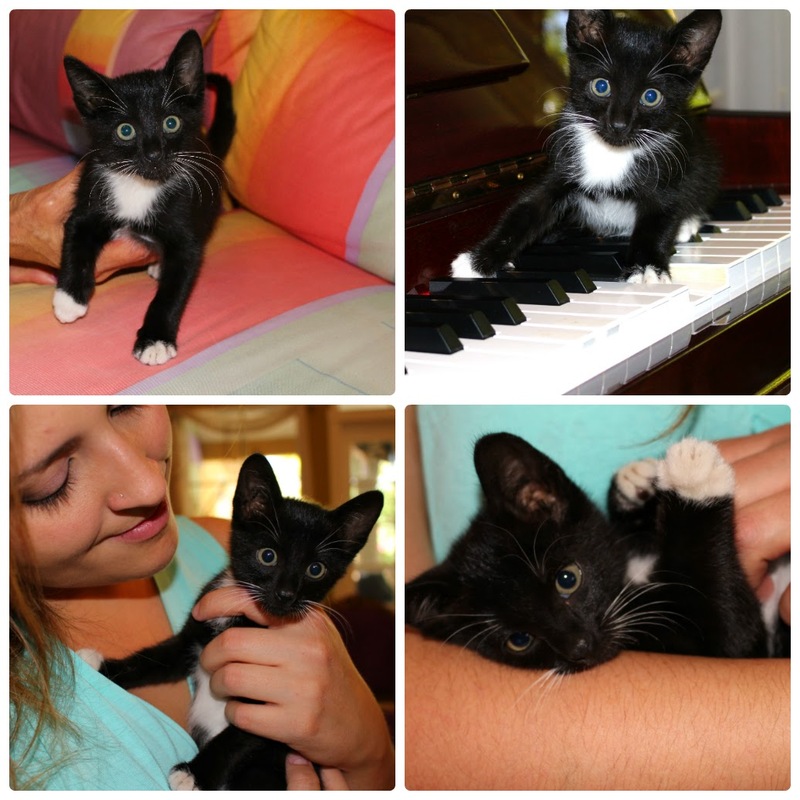 Figaro and Luciano are healthy, active 12- week old tuxedo kittens. Peter Peter is our featured cat. He's one year old now which means he's not a kitten but not quite an adult. 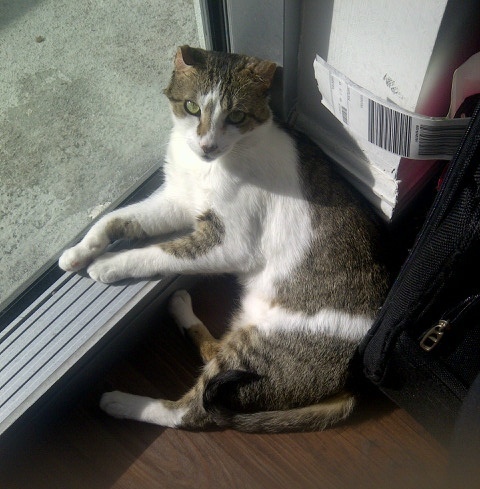 Peter is happy-go-lucky despite family hardships and gets along with other cats. (that's what Peter looked like as younger cat). ADOPTED. The Riverfront Cats total 20 and live around the neighborhood. Each cat has a name and knows their name! First we'll introduce you to Samantha and Sabrina (2 of 4 tabby sisters) and Mama Cat. ﻿ Samantha is one of four sisters and the only shy one who will not let any human pet her. Her beautiful round cherub face sparks the urge to want to pet her and hold her. She gladly accepts the food and volunteers can come within a few feet. But that's it. Her sisters, on the other hand, are not shy at all. ﻿ This is Sabrina, Samanth's sister, and the dark stripe down her back is the only distinguishable feature from her other two sisters, Tabitha 1 and Tabitha 2. Impossible to tell those two apart. Sabrina readily greets me and expects me to scratch her head and down the back. 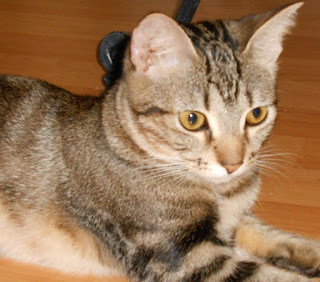 She is playful and gets along with the other cats. ﻿This has to be the sweetest cat of the colony. The prior volunteers named her Mama Cat because she had a single kitten who disappeared at tender age. 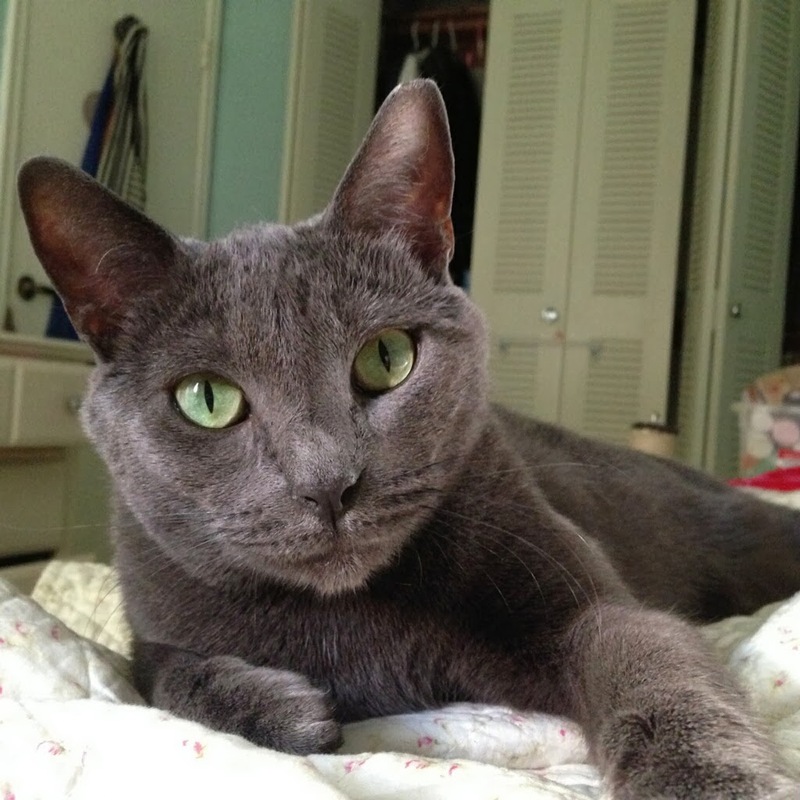 Her soft gray coat, and soothing green eyes match her sweet disposition and nurturing side. She is the first to run to me and wait for me to pet her, scratch her belly and repeat the process. Mama Cat doesn't appear to roam much so I always wonder if she would do well indoors. Probably a high risk given how long she has spent outdoors. She is at least 2 years old. Unfortunately overseeing the cat situation on top of two jobs can be overwhelming there's just not enough time to test the waters and see if some of these cats would adjust indoors. How I love this cat. How could the developer consider dumping them at some park where there is no caretaker?! We have four stations but we can not disclose them as people dump their indoor pet cats and other strays. (Please know this is illegal under Florida law). There used to be five black cats at Station 1. Tragically Nikki (the mother) and Sonny were electrocuted next door inside the transformer room at Florida Power & Light during record cold days in winter. We rushed to bring in Tiffany and she was adopted. However, in observing Tiffany, she was unhappy indoors. We learned that bringing in and outdoor cat that has lived outdoors for over a year, takes away their freedom to move about freely. But now she lives in two-story house with lots of room to run and climb. Scotty and Leroy still remain outside. Scotty needs to be neutered but he is rarely seen and therefore he's very difficult to trap. Scotty is believed to be a Scottish fold because his ears are folded down. Notice the photos below. Because he's not neutered and has little contact with humans, Scotty is feral. He hisses constantly but we know he doesn't attack. Leroy (no photo) is such a sweetheart he would rather spend quality time having you pet him instead of eating. We wanted to bring him in but after the lessons learned with his sister Tiffany, we decided he was better outdoors with his best friend Lion King. Lion King is semi-feral. After three years he finally approached volunteers and rubs against our legs. We can only pet him with his back toward us. The second he turns and sees our hand, he hisses. Fickle cat. Lion King is one of the original cats. The Queen of Station 2 was Cosette. She does not get along with other cats and prefers to be alone and reign in solitary. But in this fenced-in area, other cats discovered it was free of cars and humans. 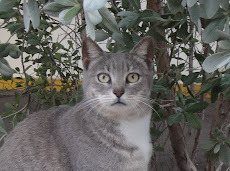 Now six cats reside there: Cosette, Tabitha, Romeo, Sabrina, plus two new cats: Funny Face (female) and a fox looking male. At this time we do not have photos of Station 2. The above photo was taken over a year ago. Only four cats feed here now: Sabrina, Mama Cat, Tabby and Gabriel. All these cats love to be petted. Tomcat waits for us at the foot of the stairs. The second he spots the feeder he runs up to us and then turns to run to announce to the other cats that it's dinner time. They all come scrambling out with glee. It's the cutest fluster of cats we have ever seen. 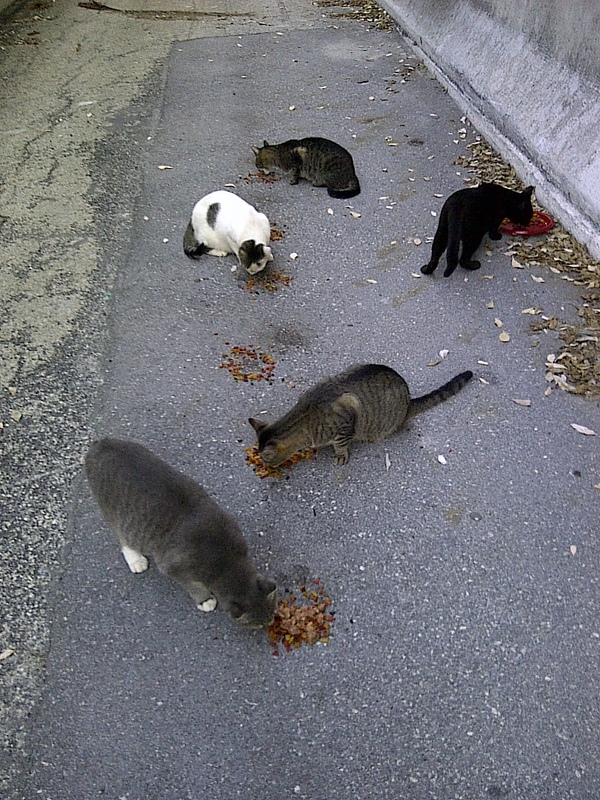 The cats are fed daily between 7pm-8:30pm, weekday, weekend, workday, holiday, sun, and rain. 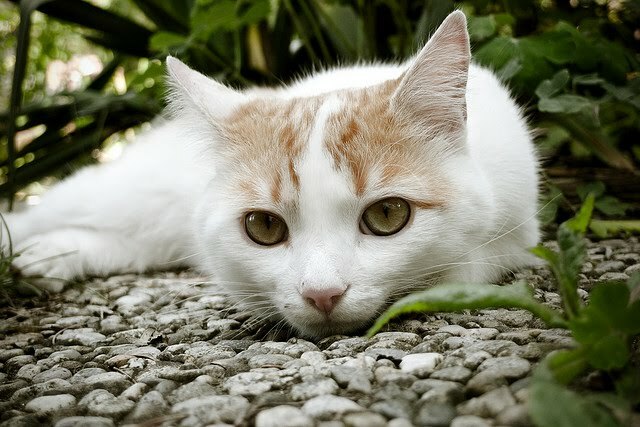 Cats learn routine and wait for us each day. They trust us for food sources which prevents them from crossing major streets and getting ran over. They are very much like outdoor pet cats and it's the most uplifting part of our day. They are always happy to see you especially when it has rained--they're starving. So even if you have a bad day, feeding these cats is therapeutic and rewarding. They remind us how happy they are with just food and shelter and little love. We could all learn from these homeless cats.